Last weekend I shared some photos of the front yard, and a Knockout Rose bush that is blooming profusely this year. Our yard has two levels and this bush is nestled in a little grotto area that is shared by a much used bird bath and surrounded by Black-eyed Susans. I thought I'd clip a few sprigs of blooms and bring them inside to enjoy up close. 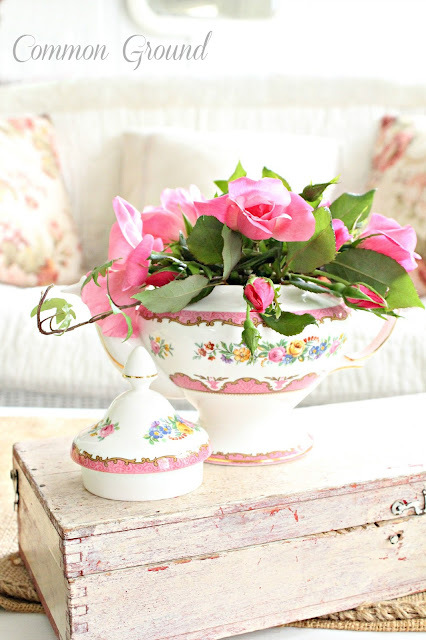 I thought they'd feel at home in this petite Staffordshire Crown China teapot, trimmed out in a lacy pink pattern of flowers with gold trim. I also just recently found this little white chippy box and thought it might work for one of my "Vintage Seed Box" embellishments. 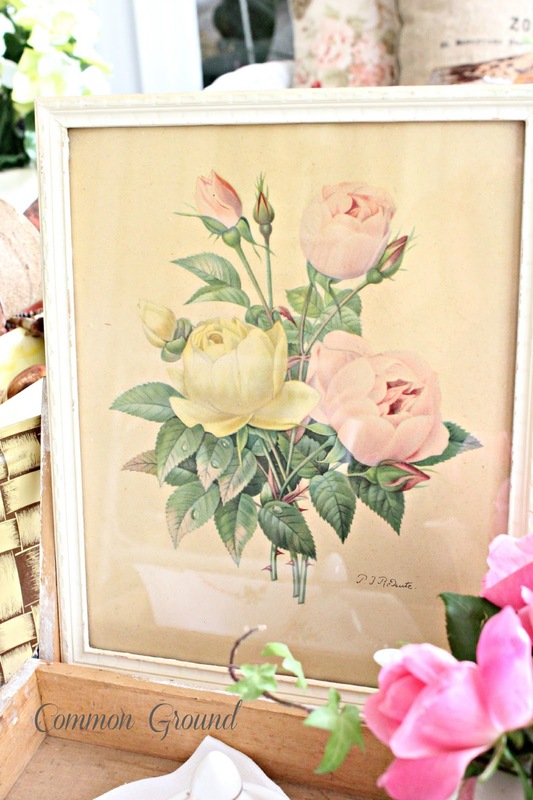 Spring and Roses go together beautifully with one of my two vintage Redoute framed prints from the 40's, that I had on my baker's rack on the sunporch. Below, I included some interesting information about Redoute. Knowing a little about the artist makes these beautiful prints all the more interesting. Pierre-Joseph Redouté (10 July 1759 in Saint-Hubert, Belgium – 19 June 1840 in Paris), was a Belgian painter and botanist, known for his watercolours of roses, lilies and other flowers at Malmaison. He was nicknamed "The Raphael of flowers". Paris was the cultural and scientific centre of Europe during an outstanding period in botanical illustration (1798 – 1837), one noted for the publication of several folio books with coloured plates. Enthusiastically, Redouté became an heir to the tradition of the Flemish and Dutch flower painters Brueghel, Ruysch, van Huysum and de Heem. Redouté contributed over 2,100 published plates depicting over 1,800 different species, many never rendered before. Marie Antoinette became his patron. Redouté received the title of Draughtsman and Painter to the Queen's Cabinet. In 1798, Empress Joséphine de Beauharnais, the first wife of Napoleon Bonaparte, became his patron and, some years later, he was her official artist. What perfection is found within the bloom of a rose. My heart is heavy with all the devastation in Oklahoma. We are in the same "tornado alley" as they are. Storms start in North Texas and then take the northeast route each Spring. Many of us here in Missouri have basements, but Oklahoma has so much bedrock that basements aren't incorporated into a home's structure; not much comfort, but a little. I'm praying for all those who have lost so much in these storms this week. 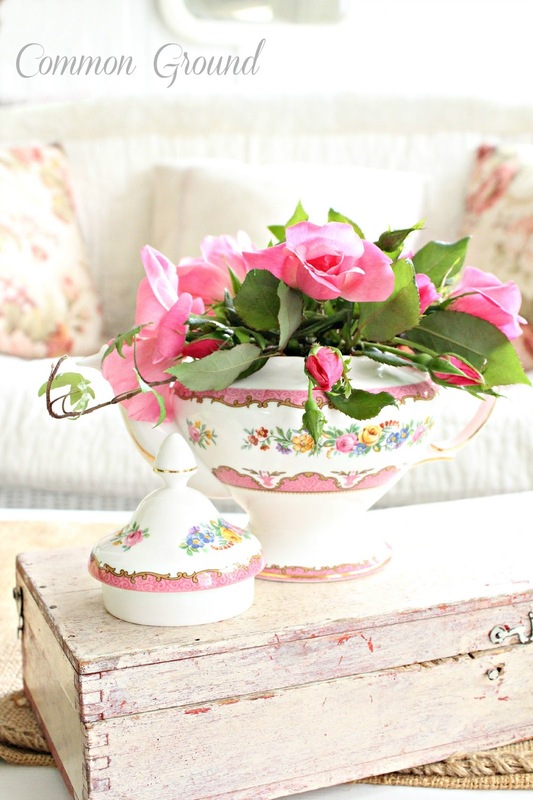 Your pretty pink roses are perfect in the floral teapot and the whole scene is indeed, serene. A calming collection of soft petals and greenery. Thanks for sharing. What perfection is found in your photographs!!! Just soooo pretty. 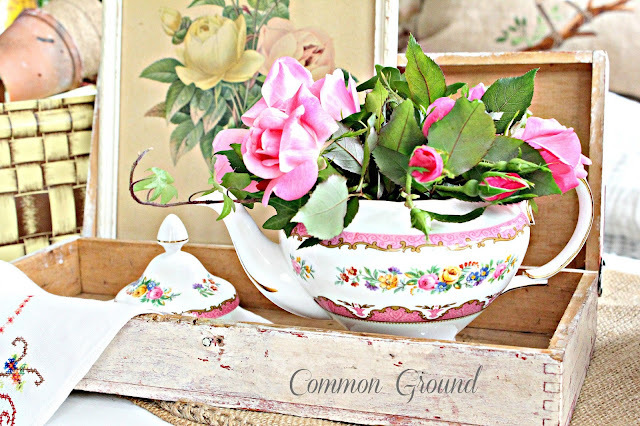 It looks as if the teapot was really made to hold roses! What a lovely post. 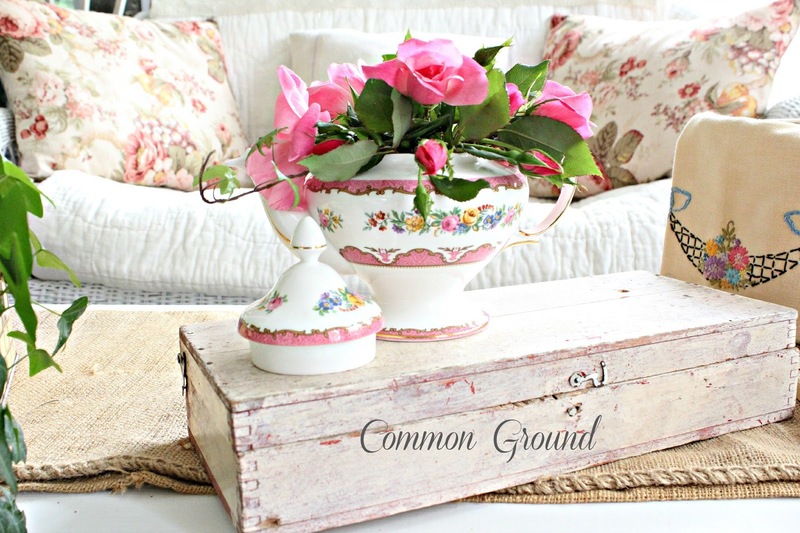 The tea pot with the pink roses is stunning and I like the chippy tray. Everything works so well together. I too am praying that the terrible weather stops and that they find all the children alive. What a year so far. I pray that everything will settle down. Beautiful post and thanks so much for the history lesson. I love his work. He is one of the premiere rose painters as far as I'm concerned. I never realized he dated back to the time of Marie Antoinette. It's nice to see some beauty in all the sadness. My heart breaks for all those that lost so much in that horrific tornado. our knockout roses are gorgeous, the pink is so true and clear! I'm so happy to have recently found your blog. It is a treat for the eyes and soul as well as a great directory to Etsy shops I've never seen. From one Missourian to another, thank you for your creativity, beauty and generosity! Your roses are beautiful, Debra! I am looking for a pink like this, but so far I've only noticed either dark pink/rose colored or red ones. I need to look a little more in-depth next time I'm looking at plants. Now those are photos worth framing! Beautiful. All your roses that you've put together are just gorgeous! Hi Debra, I have enjoyed reading your blog tonight. The roses are beautiful and one of my many favorite flowers. We had our share of stormy weather lately and I am praying for the people in Oklahoma and Kansas. So much destruction and lost of love ones. I enjoyed the previous posts. Have a wonderful day. Hugs and Prayers from Your Missouri Friend. 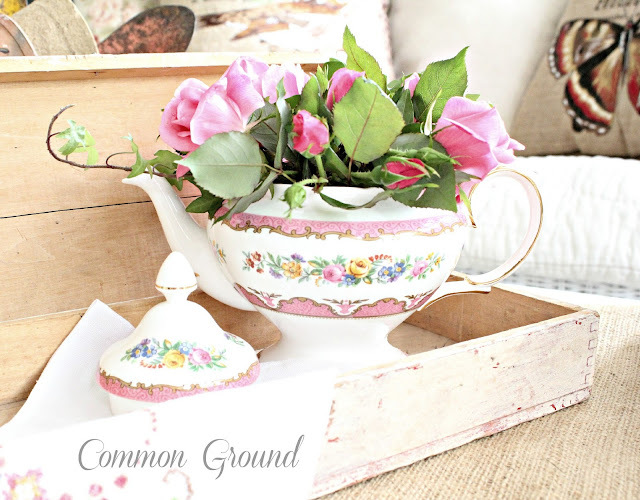 The roses and rose teapot are perfect companions. Beautiful job....thanks for the info about Redoute, also. Such beautiful blooms, Debra. They look absolutely stunning in that teapot. Your pics are absolutely heavenly- just wow wow wow, love it so much, how I would love to have tea and sit in front of that table with its amazing vignette. AWESOME!!!!! sooo pretty, debra! "knockout" roses really live up to their name and your vignette is beautiful. The info about Redouté was very interesting and that teapot is exquisite. Debra, the roses in the teapot are just the thing! I adore clipping flowers from the yard and bringing them inside. Makes all the difference. Thanks for stopping by Quirky Vistas and checking out my little cart. I'm a sucker for wheels and that knob too. After I put it on there, I had to go and check to make sure Anthropologie still sells them. I love that little knob. It works for many things. Glad you stopped by! Gorgeous photos! 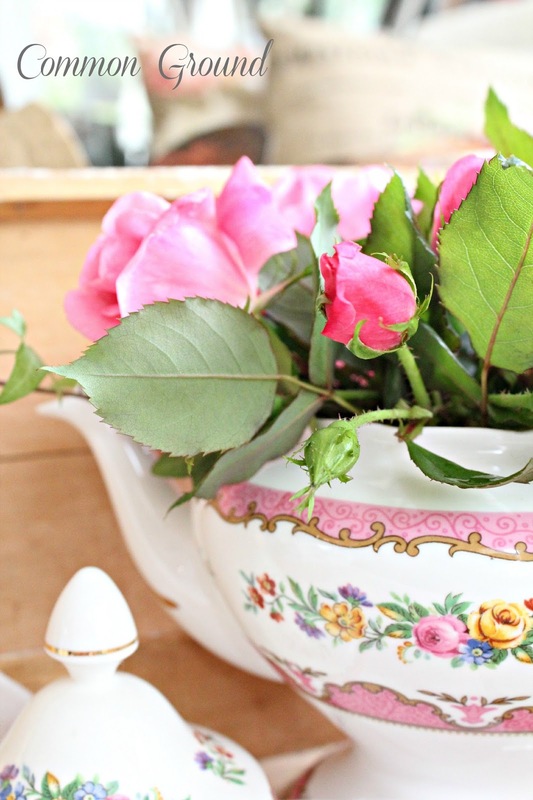 I love that you used a teapot as your vase - what a beautiful touch! 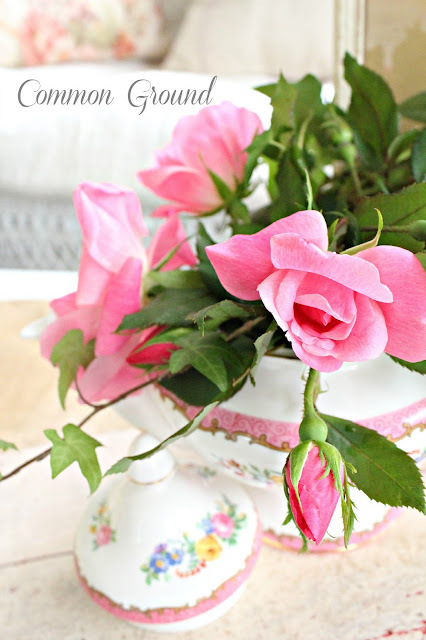 Good Evening Deborah, This is a delightful way to display beautiful cut roses. The teapot is just perfect for them. I love the addition of what I think is a small tablecloth. 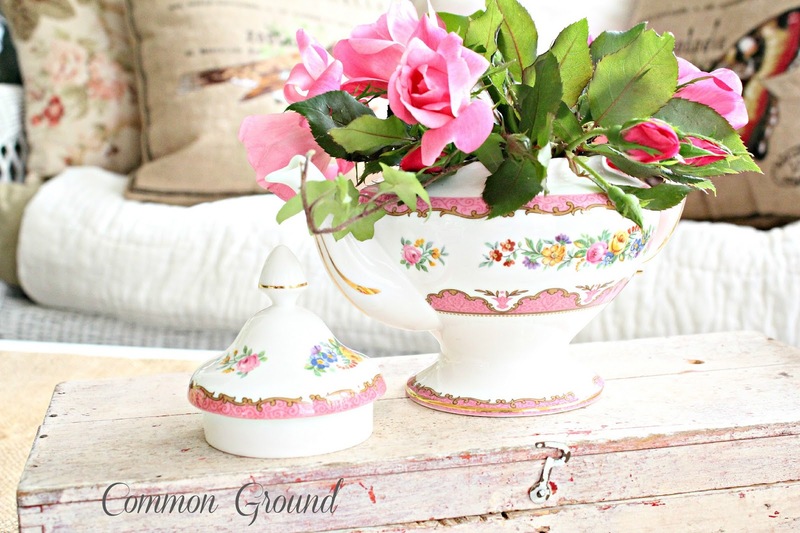 I love embroidery and this sits so well with the roses. Just lovely. Such a beautiful post. I love the china and roses and Redoute prints have been favorites of mine as long as I can remember. I would love for your to join my Vintage View Sunday link party. This post would be perfect! Debra, Your roses are gorgeous in the teapot. My son gave me a knock out rose for Mothers Day last year. My roses are not blooming yet. Can't wait till I have blooms to bring indoors. Love the box and the art work. I have not heard of him before, but I adore his work! Thanks for sharing with SYC. The way you displayed your teapot and roses is just beautiful. I wonder if knock out roses come in different varieties because the ones that I have are just a bit scruffier and more open. They provide lots of color all year here and I haven't killed them yet so that is a wonderful thing for this otherwise black thumbed girl. I do try tho. I loved the history lesson too of the picture of roses. 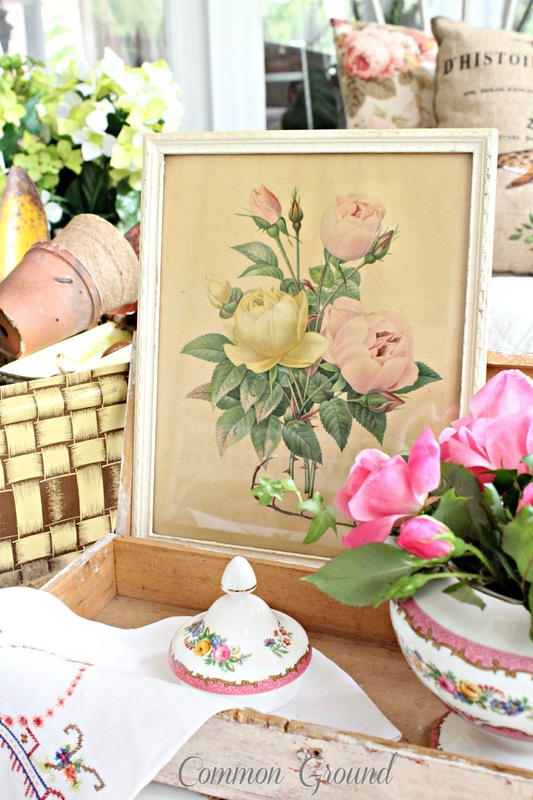 I have been drawn to old vintage floral prints and have a good many that I got for the shop and fell in love with and kept. Today I will go and study them out just to see what I really have. Debra, Thanks for always sharing at Simple & Sweet Fridays. Beautiful post with such pretty vignettes! Teapots and roses... it doesn't get more shabbiliciously gorgeous than that! Thanks for linking up at Shabbilicious Friday this week. I really appreciate it. Just beautiful Debra. Thank you for joining Home Sweet Home.